What Does It Mean to be WordPress Optimized? What do web hosts mean when they say optimized WordPress hosting? You already decided you want to use WordPress to build your site. Do you really need special hosting services for WordPress? It depends on what you want your WordPress site to do and your technical abilities. Here’s what you need to know about web hosting services optimized for WordPress. The first thing to keep in mind is that not all WordPress optimized hosting plans are created equal. It’s important to have clear goals for your website and a thorough understanding of your site’s technical requirements. WordPress sites require different tools and resources than other content management systems. As a popular CMS, most hosts offering WP optimized services will include compatible server resources that meet the technical requirements of WordPress. WordPress sites can be more resource intensive than other content management systems. So, you want to make sure your host server can handle a WordPress site. Usually, Apache or Nginx servers are recommended for WordPress users. Apache servers allow configuration through your site’s .htaccess file. Nginx servers don’t offer .htaccess like Apache, but they can increase your site’s speed. Nginx is designed for high-traffic situations. It proxies script processes like PHP so it can focus on faster connections between site visitors and your server. Apache runs script processes internally, which is why it isn’t as fast as Nginx. While Apache will work well enough for a WordPress site, Nginx was designed specifically to handle a high volume of web traffic. If speed is your goal, you may want to look for an optimized WordPress hosting plan that provides Nginx. If you’re more interested in creating your own custom server configuration, look for Apache. pair Networks offers both Nginx and Apache WordPress solutions. If you have a WordPress site and you want Apache, you can get a regular web hosting account with pairSIM. pairSIM is an addon that allows you to install WordPress on a Shared hosting account. pair’s optimized WP Hosting uses both Varnish and Nginx to speed up your WordPress site. WP Hosting makes managing a WordPress site easier than using a Shared account with pairSIM. You can also increase the speed of your WordPress site with Varnish. Varnish is a caching software capable of making your site as much as 1000% faster. It uses a proxy server preloaded with your website to intercept requests from site visitors. Then, it delivers the preloaded website to users trying to access your site. Varnish also re-caches the site to keep up any with updates and changes that you make. Cyber security shouldn’t be an afterthought. Even small business and personal websites can be hacked. While exploring hosting options for your WordPress site, look for plans that offer security features in addition to a compatible server. pair includes the WordFence security plugin with all of our WP hosting plans. WordFence is a firewall and malware scanner optimized for WordPress sites. You should also look for a WordPress host that offers SSL certificates. SSL certs not only improve your site’s search ranking, but will also protect your website visitors. 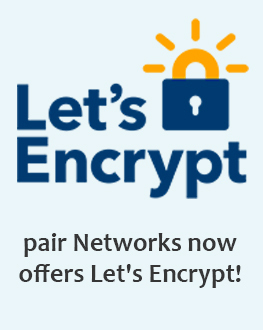 pair offers a variety of secure certificates as well as the free Let’s Encrypt option. 404 errors, missing pages, etc. Many of these issues can be resolved quickly with the right technical knowledge and server access. If you don’t want to deal with these issues, find a good web host with great customer service that supports more than just the basic requirements for a WordPress site. 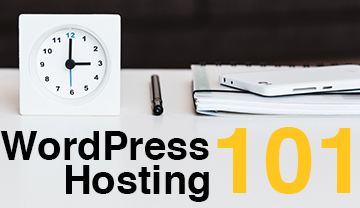 The main benefits of web hosting optimized for WordPress are that it’s faster to implement than a regular hosting account for WordPress. Everything is already installed, set up, and ready to go so all you have to is move your site to the WP optimized server (or get someone to do it for you). It’s also easier to manage a WordPress site if it’s hosted on an optimized server because you’ll encounter fewer technical issues. Basically, optimized WordPress hosting means a long list of things you don’t have think about. A good web host will offer in-demand WordPress features like a staging environment and configurable backups. You can use a staging area to protect your site from yourself. If you want to test changes without breaking your site, you can use your staging site. pair makes it easy to upload changes to your site without having any downtime. Access to backups will help you keep your WordPress site safe. In the event that your site is hacked or lost for one reason or another, having up-to-date backups will make restoration easier. Regular hosting accounts may allow you to manage backups, which will give you more control over when backups are created. With pair’s hosting optimized for WordPress, you won’t even have to think about managing your backups. Once you configure them, they’ll be automatically generated for you on a regular basis. In addition to all of these features, it shouldn’t be impossible to manage everything associated with your WordPress site. Find a host with a user-friendly interface that you can work with. The custom-built account control center (ACC) for pair WordPress accounts is streamlined to make managing domains, email, SSL certs, backups, and staging sites easier. You can seamlessly jump between your WordPress editor and the ACC with a pair WordPress account. Move your WordPress site to pair Networks for free! Sign up to receive email from pair Networks and we’ll send you a discount code to use for WP Hosting. Move Your WordPress Site for Free!